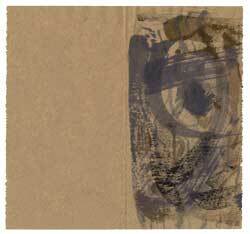 In 1988, Ray Kass, professor emeritus of art, Virginia Tech, invited seminal composer, philosopher, writer, and visual artist John Cage (American, 1912-1992) to paint at the Mountain Lake Workshop in Blacksburg. They began a series of experiments with watercolor pigments that resulted in 55 densely marked paper towels. Two decades later, Cage’s pupil and friend Stephen Addiss created three sets of images that echoed the narrative of the “Ox-herding Pictures,” an illustrated parable to which Cage often referred in his discussions and writings. This exhibition features 50 watercolors on small paper towels, accompanied by samples of the artist’s writings. This exhibition is on loan from the University of Richmond Museums. The Daura Gallery was recently given a collection of baskets from the Lauren Rogers Museum of Art in Mississippi. This exhibition, curated by Museum Studies intern David Satchell ’12, features baskets from China and Japan, along with other objects from the collection including a scroll, woodblock prints, and ceramics. Antonio Carbonati (Italian, 1893-1956) was trained at the Fine Arts Academy in Venice, worked in Paris, and exhibited throughout Europe and North America. His series of etchings, including the series on Rome, are the cornerstone of his work in international circles. Although Pierre Daura accepted an occasional portrait commission, he much preferred to paint people when and as he wished. His favorite models were his wife Louise and his daughter Martha. 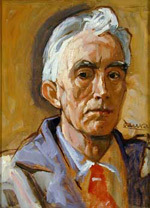 He also painted a lifelong series of self-portraits, often as a means of “warming up” at the beginning of the work day. Those of his last years eloquently reveal both the serenity of having done what he set out to do and pathos of physical decline. This exhibition features works from the Daura Gallery collection and the private collection of Martha Daura. The Daura Gallery is open 9 a.m. to 4 p.m. Monday through Friday. For more information, call 544.8343.